memories come flooding back of my childhood and the many songs that my parents would sing. “The Easter Parade” by the songwriter Irving Berlin. My mom loved it when Judy Garland sang it. I think I know every Judy Garland song there is! Call me a sentimental sap! 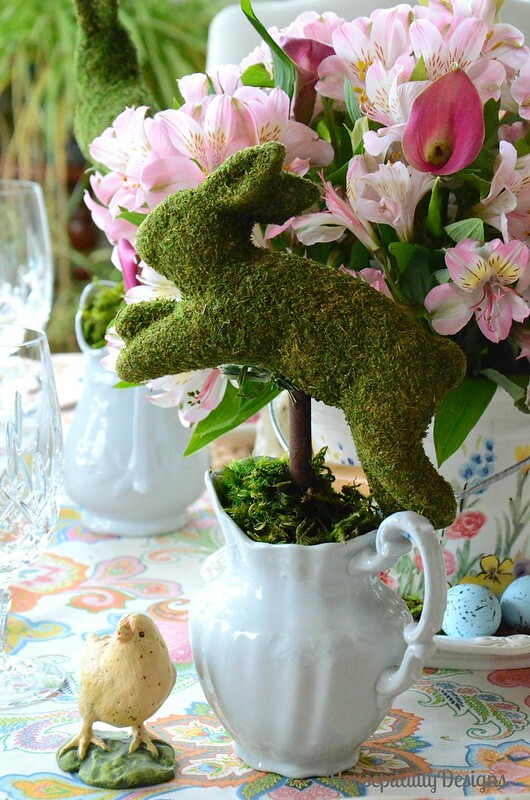 The Easter Bunny Parade Tablescape and a Giveaway! See details for the Giveaway below. that I created last year for my Dinner Group party. how to make bunny ears out of napkins. to do for my dinner group this week. Our dinner group consists of 4 couples and we each take a turn. We meet 4 times a year and we have been doing this for almost 9 years. It is my turn and I set the table today. first Spring project this year. 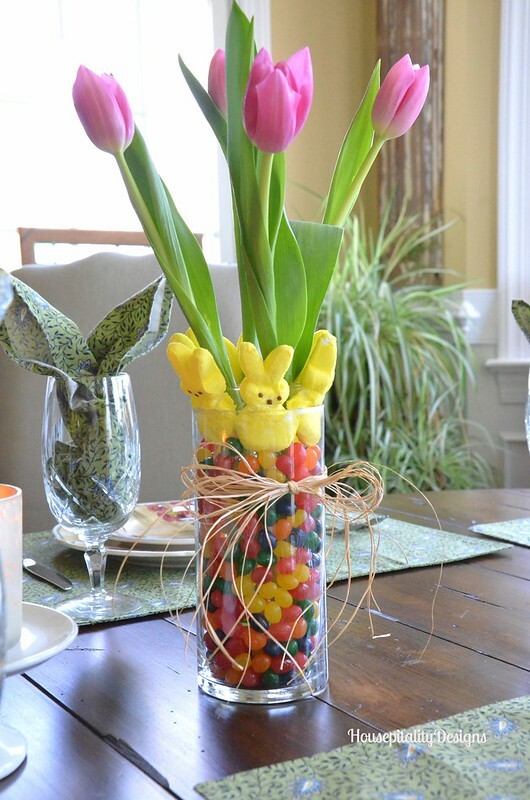 that coordinated well with the items on the dining room table. One table with 5 different looks. This table gets a makeover quite often . . . So today I thought that I would present its many facelifts. 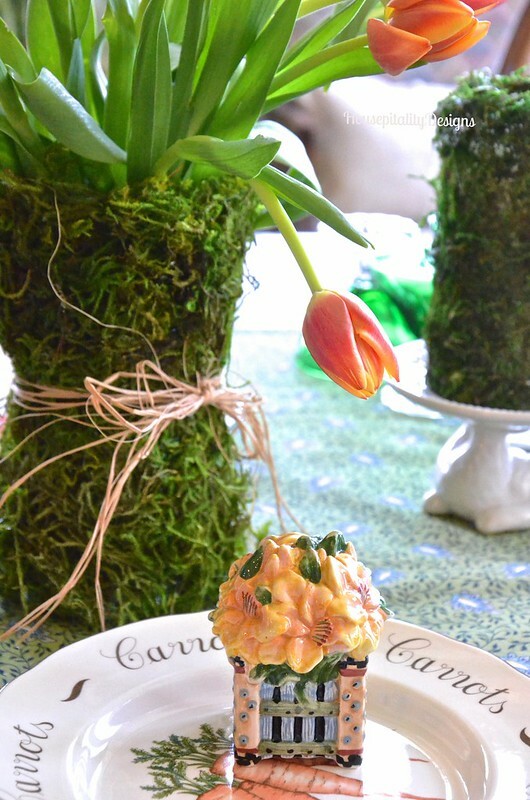 Another tulip arrangement that was a “just because” gift from my sister . . .
~ ~ sparked this new vignette. I love the Fall so that I can use great pumpkins, gourds and seasonal flowers . . .
~ ~ to create a one of my very favorite Seasonal Fall Vignettes. Oh did I say that the Fall was one of my favorite times to decorate this table? Let me correct this statement . . . Yes, I so love the Fall season . . .
~ ~ however, hands down a Christmas Table Vignette is my most favorite to create. As who can resist placing the cute animals of winter on a table to enjoy. Whether it be Spring, Summer, Fall or Winter . . .
~ ~ I love including silver into my table vignettes. Silver and daisies . . . one of my favorite combinations of elegance and simplicity. Combining the textures of metal and natural elements as seen in this Spring Table Vignette. As I look at the past vignettes on this table . . .
~ ~ I am now thinking about creating a Fall tablescape. I know…this is still July, but today, the temperature in my car said 71 degrees . . .
~ ~ with record breaking lows in many areas. So, did your temps fall like ours did? . . . what a pleasant surprise. Have a great day doing the things you love with the ones you love!